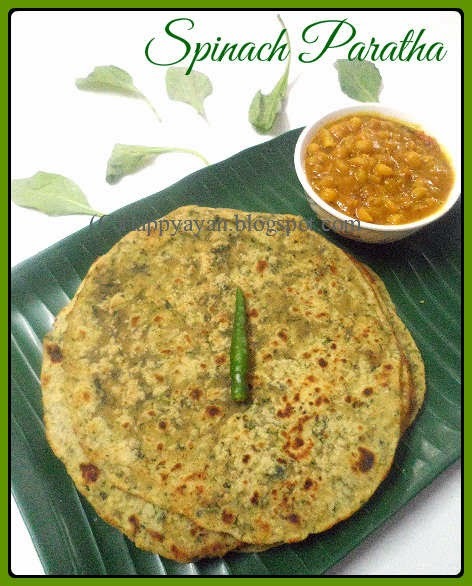 in Indian Bread/paratha, Microwave Recipes, Non-veg., Side dish, Veg. Last week, on a busy and hectic day, running after lots of appointments, I put my microwave to work. I had a plan to make a quick keema curry for dinner. That day, I thought to make it with spinach added for extra nutrition. Then the next thought, what we'll have the keema curry with? One recipe clicked suddenly on my mind what I saw few days back on Rak's Kitchen, Easy Spinach Paratha and within few seconds the menu was decided. Spinach paratha and keema with spinach was our menu that day. To expediate the whole process, I decided to make my keema palak(keema with spinach) in my microwave. I made parathas while my keema palak was getting cooked in microwave at the same time. In less than an hour, my dinner was done and served. 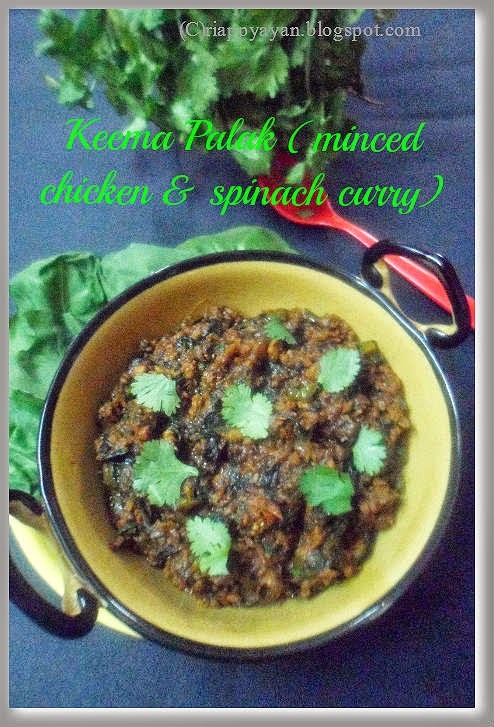 Keema Palak recipe I tried, is from my microwave cookbook, by Nita Mehta. Aren't they looking yummy together ? Vegetable Oil : 3 tblsp. Ajwain seeds : 1/2 tsp. In a wide bowl, take whole wheat and white flour, salt, oil and yoghurt. Give everything a good mix. Keep aside. In a pan, heat oil, add ajwain and cumin seeds in oil, add garlic and green chillies too, saute for a minute, then add spinach leaves.Spinach will leave lots of water now, let it evaporate, season with salt and when water dries up completely, remove and let it cool. When it cools down completely, add the whole spinach mixture on the bowl of flour, then with enough water, knead the dough well with spinach. Cover the dough with a kitchen towel and keep aside for 1/2 an hour. Make small balls out of dough and roll out parathas in 2-3" in diameter. you can make it thick or thin as you like. Frying the paratha : Heat a tawa and place one rolled out paratha, keep it for few seconds, then flip to the other side. When this side is done, take out the paratha, add 1 tsp of oil, add the fried paratha again on the tawa, quickly smear the oil on both sides of paratha well, then in medium flame fry them on both sides. Continue same way with other parathas. Chicken Keema ; 500 gm. Kalonji/Nigella/black cumin seeds : 1/2 tsp. Fenugreek(methi) seeds : 1/2 tsp. Put butter or oil in a microwave safe dish and microwave for 30 seconds. In there, add cumin, nigella, fenugreek, crushed fennel, turmeric and very finely chopped onions. Mix well and microwave high for 4-5 minutes. Add keema, mix well and again microwave for 2 minutes. Now add shredded spinach and prepared tomato paste. Mix and microwave for 7-8 minutes. take out and stir once in between. If you feel, the keemais getting dry, can add 1/2 cup of warm water. Season with salt and microwave again for 3-4 minutes or till the keema is almost dry and cooked. Let it stand for 5 minutes before serve. Your Keema Palak is ready. Labels: Indian Bread/paratha, Microwave Recipes, Non-veg., Side dish, Veg. This looks super delicious. 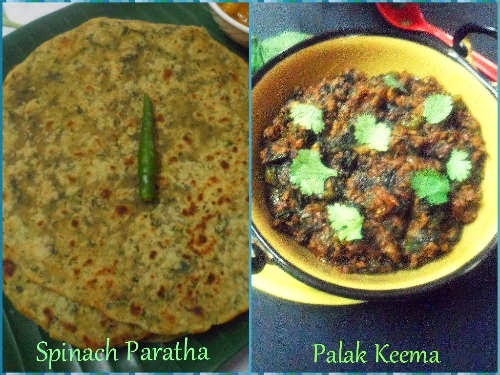 Absolutely yumm..
Cant resist to that palak kheema, fantastic parathas.